Being with a Chinese man is fundamentally different, yet rewarding, and brings great joy to Kathy De Leye, an entrepreneur in the health business who comes from Belgium. However, one challenge that Western spouses point out about their Chinese husbands is communication. "Chinese men do not really communicate," she said. "My husband is like a robot. If something is wrong, such as a problem at work, he won't talk about it." According to her, this behavior is different from their Western counterparts. She said compared to men from the West, her husband is very quiet and works much more. "You can tell when a Chinese man is clearly thinking about something or something is bothering him. But the fact that he's not saying anything bothers me," she said. The couple has already had a few fights because of the communication issue, but they are working on finding a solution. 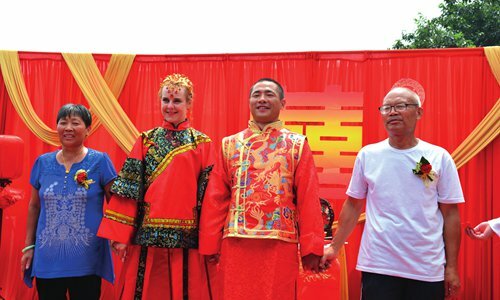 As Chinese society becomes more international and modern, cross-cultural marriages are becoming more and more common. Today, on International Women's Day, Metropolitan, China's expat community lifestyle guide, shines a spotlight on expat women in the community who are married to Chinese men. From a female perspective, they share what their lives are like with Chinese men in relation to a woman's status and role in the relationship and what rights are like in a cross-cultural union. As both De Leye and her husband are busy with their work, she wants to make sure that the two of them have an evening together every week to just sit and talk or watch a movie. However, she has to convince her husband that it is important for their marriage and not a "waste of time." 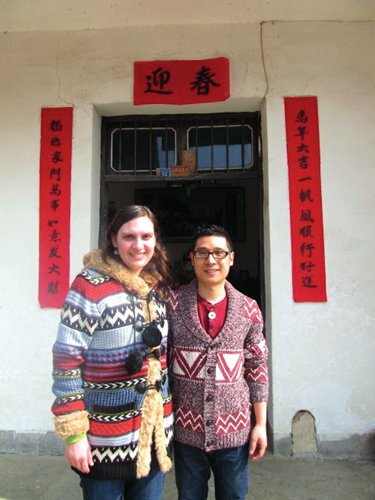 Jocelyn Eikenburg, who lives in Beijing and founded the popular expat blog Speaking of China, describes being married to her Chinese husband as "intercultural, interracial, international and bilingual." Like De Leye, Eikenburg also found that there are major differences in the way she and her husband express their feelings. Growing up in the US, she watched her parents express love through words, kisses and hugs. "Here in China, love is something that is shown through actions, such as making you your favorite dinner or buying you something special, and married Chinese men are less likely to kiss or hug their spouses in front of others." 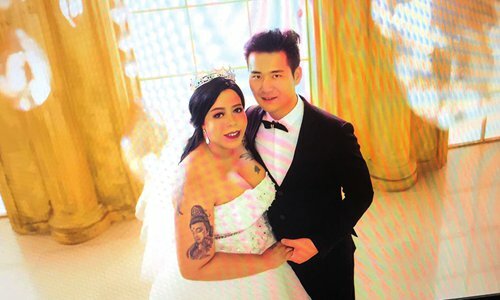 In terms of how love is shown, Jo Bai, an American who owns a fashion business and lives in Yuyao, Zhejiang Province, said she finds Western men communicate more and understand the value of birthdays, Valentine's Day and anniversaries more than Chinese men. "Chinese men tend to think that once you are married, you do not need to think about those holidays anymore," she said. The other difference is how they value and think about money, Bai said. "It seems Chinese men have their main focus on money and the need for it. I don't see most Western people giving up family time to make money," she said. "One thing I find strange is the way he tries to save money on small things like cheaper food or electricity, but will want to spend a lot of money on things like an iPhone or a gold necklace." Bai describes her marriage as a matriarch. "I think this is because my husband is 17 years younger than I am. I make most of the decisions. When it is something big, we will discuss it together but usually, I make the final decision." Although most Chinese men have the stereotypical idea that women should cook and clean, according to Bai, fortunately, it is her husband who does more in managing the household because "he is a bit compulsive and needs to clean all the time." All over the world, societal norms still suggest that the husbands should work and support the family financially and the wives raise the children and manage the household. However, according to the expat women married to Chinese men interviewed by Metropolitan, the norms are changing in China. "My husband does a lot in the household such as cooking and doing the laundry," De Leye said. "I really like that about Chinese men." She was surprised during her first few years in China to see women in China being strong and holding the power in their relationships and marriages. For example, you can see men carrying everything for women, even their purses. According to Bai, getting married to Western women already shows that their Chinese spouses are more Western-minded than others. Cross-cultural marriages like theirs can be diversified and modern, while in a Chinese marriage, the roles are more defined and expected. Bai started dating Asian men in high school. Part of the reason she prefers Asian men comes from them being more family oriented. She likes the idea of having a "traditional man" shown in American TV shows she likes such as Happy Days, which first appeared in 1974 and depicted life in the mid-1950s and 60s and the popular 1950s sitcom Leave it to Beaver that followed the life of a suburban family in the mid-20th century. But for Chinese men, the definition of being family-oriented differs with that of Western men. They tend to focus more on the extended family rather than their nuclear family, Bai pointed out. "I didn't realize that there was so much devotion to siblings and family, even over the wife sometimes," she said, which she admits bothers her a little. In China, there is saying that a man's temperament and how they treat their wife are influenced by the local culture. In cross-cultural marriages, does it have something to do with the family that the man comes from? De Leye's mother-in-law is a loud woman from rural Sichuan. The first time they met each other, she was surprised to see how strong women from Sichuan could be. They rule the households. Her father-in-law is quiet and never speaks up, which from what De Leye hears, is how a typical Sichuan household runs. The experience helped her understand her husband's character and that he respects women and would drop everything to help her if she needed something. De Leye has heard from her friends, who date or marry men from other places in China, about how men can be dominating and want their women to be good housewives. "The husbands go out and drink with friends and smoke at home. I am happy that I have a Sichuan man. When I hear the stories, I think to myself that I couldn't be with a guy who's so dominating in a relationship." Eikenburg says her husband is wonderful at home. He does a lot of housework and always helps prepare dinner. His ideas about couples sharing the work might have been influenced by his parents. When he was growing up in rural Zhejiang Province, both of his parents had to work and also helped around the house, she said. "There's no doubt that in a country as large as China, there are regional differences in terms of culture and that may influence what families tend to consider the norm in marriages and households. And I have heard some of these ideas, such as how Shanghai men supposedly make great husbands," she said. "My husband's family is also an example of a household that might not have followed the typical pattern for the village, which reminds me that it's always important to keep an open mind and never assume that a person will fall in line with the general beliefs or stereotypes." Eikenburg also noted that there is a drastic difference on this point between the urban areas and the countryside. "I'm pleased that my brother-in-law and sister-in-law, who have a daughter, always tell her that they want her to go to college and do well in school; that's encouraging to see." Having lived in China for 11 years, Bai finds women's rights in China are "slowly improving." "I am seeing more female bosses, women making big decisions, running companies and not settling on just doing housework," she said. De Leye says she has also met a lot of strong Chinese women in the cities. "They are well educated. They have more opportunities to enter management and climb up the career ladder," she said. "Unfortunately, women from the countryside still have to listen to their in-laws and husbands and have to have a son, which is what I hear." Western society might need to update their view on Chinese women. When De Leye goes back home and talks about the situation in China, she finds a lot of people still see women in China as submissive to their men. They choose to see just the one-child policy of the past and the "leftover women phenomenon" of the present. "[What they don't see is] that women want to be independent and many choose not to have a second child and to have a career." "Yes, there's the 'leftover women' name, but they don't care. It's their choice. If going higher on social and career ladders is what a woman wants, then she should go for it. I really respect those women," she said. "I see that everywhere in the world that men are quite afraid of powerful women. But I am happy to see that in China we don't care. There're a lot of improvements toward women's rights in China, which I really like here."